Inspired by the 16 bit era of gaming and driven by contemporary rock riffs, this album will take you on a hero's journey across a wonderful soundscape from the exciting tunes of a game's first level, to the climactic themes of a villainous confrontation! 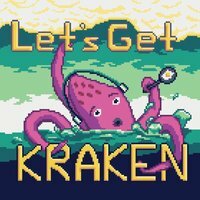 Let's Get Kraken is an experimental chiptune project from a music and video game enthusiast. Written in the short time frame of six months, this coffee loving metal-head dove into the space between modern rock rhythms, catchy melodies, and video game style arrangement and tried to blend them into a wonderful soundscape. This album is fun and lighthearted, fit for all ages, and excited to unleash powerful synths upon your ears. Get ready to embark on a hero's journey, because this album will take you from the joyful, upbeat tunes of a game's first level, through the intense beats of the jungle, over soft melodies of snow covered hills, into the bubbly rhythms of the sea, all the way to climactic themes of the overlord's lair for the final confrontation, and back home to share in the celebration of victory.